The Key Executive Leadership Programs welcomes Key MPA Cohort 39 and Key Certificate Cohort 11 to AU. Both cohorts begin their learning journeys with 17 students each. Key 39 will meet as a group for the first time at Orientation on August 20. Classes begin September 4 with Program Director, Professor Bob Tobias. Key 39 will continue with their classes every other weekend for the next 22 months. Cohort 11 begins their program with Orientation on September 17. Classes start October 2 and continue for the next 8 months. 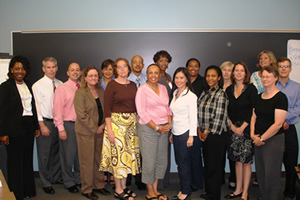 Students will graduate in May 2010 with a Certificate of Achievement in Leadership in Public Policy Implementation. For nearly 35 years the Key Executive Leadership Programs have transformed good leaders into extraordinary leaders. The Key MPA and Certificate Programs largely serve leaders employed by the federal government, though a significant number of state, local, nonprofit and private leaders also graduate from the program.